AZUSA, Calif. – June 19, 2014 – Northrop Grumman Corporation's (NYSE:NOC) Azusa facility has announced the two winners of its annual Engineering Scholars competition, which will provide $20,000 in scholarships this fall for graduating San Gabriel Valley-area high school seniors planning to pursue a career in engineering, computer science, physics or math. 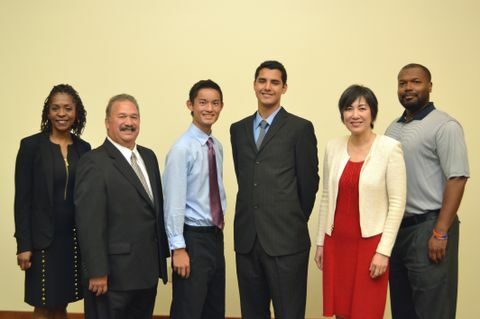 Donovan Gonzales from Don Bosco Technical Institute in Rosemead and Bryan Zhong from Bonita High School in La Verne each received the merit-based scholarship of $10,000 – payable in $2,500 installments over four years – during an awards reception and dinner hosted by Northrop Grumman in Monrovia May 27. "Northrop Grumman has a long history of supporting education in the science, technology, engineering and mathematics [STEM] fields within the local communities," said Anne Ostroff, vice president of Northrop Grumman's Azusa Operations. "These outstanding students are the future of our nation and the scholarships will go a long way to help them achieve their academic goals." A committee of Northrop Grumman employees selected the Engineering Scholars winners. To be eligible, each scholarship applicant had to be a resident of the San Gabriel Valley area and a graduating senior this spring from a public or accredited private high school in the state. Applicants also had to have a minimum composite SAT score of 1,700 or ACT score of 27 and a minimum GPA of 3.5. Recipients of any other Northrop Grumman-sponsored scholarship were not eligible. The committee also took into consideration work experience, community involvement and extracurricular activities.